There comes a time at any man’s life, where he enters their workroom oh-my-god-kids-what-is-going-on-room and something smelled funny. Smells metallic. Burning. My socks on fire? No…. What is it? Smelling my way towards the source, I found it to be my computer. Or more precisely, my four years old power supply’s fan has decided to die on me. A dying fan means that the computer is heating up, which means that blue screens of death will pop in any second now. I quickly went to the nearest computer store and bought myself a new unit with two fans. I figured if one will die the other one will still be there. Total cost – 65 Dollars. Definitely worth it. Just before I throw the little guy to the little recycle bin in the sky, I wanted to say good buy in an appropriate, nice way. After all it did give me power for four years. Loosing my power supply got me thinking that I need better backup to my pictures than the external hard drive I am currently using. After all my pictures are stored on my personal computer. If you have an idea, please post it in the comments section. I also went to reread some of the great stuff Brian has to say about backing pictures up. So aside from the ode, there is also a setup shot and some explanations after the jump. The main model is my dead Power Supply Unit. IT had served me well as a power supply and well as a main product model. 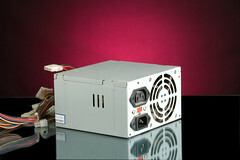 The main challenge was lighting all the sides of the power supply well. So before I made this shot, I reread chapter 6 – Metal on the best lighting book ever. For setup I used my living room table topped with a black Bristol board and a piece of glass. This glass will provide a reflection to the power supply. I used this glass since it was here around the house, but I am now looking for more portable solutions. Keep tracking. I used some black muslin for backdrop and setup my lights. (Click on the image for setup notes, or read the full description here). My main light was a Nikon SB 800 behind a shoot though umbrella. I set it at about 1/4 power. It was important to set it up so it would cover the entire Family Of Angles for the right side of the power supply. How do I do this? There are many ways to solve this problem, I used a Thought Experiment. I love thought experiments, as they help me build an intuition about how to approach a similar problem the next time it comes. So here is what went in my mind: Darn this power supplier – had to die on me just when I need it the most. Strike that. What if my power supply was made from mirror instead of metal? And what if my camera lens was emitting light in a flash-like way? The light would come from my camera cone shaped and hit the side of the mirror box (AKA power supply unit). It will then spread in a different cone in this direction. Now all I need to do to cover the family on angles is to place a light source big enough to cover the cone. 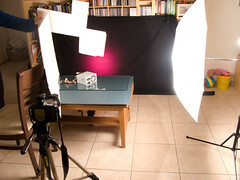 Using this technique, I can guarantee that light placed in the imaginary place of the cone will fill the entire surface of the box as it is seen by the camera. I am done with the right side. What about the left side. The experiment is just the same for the left side. Shoot a cone of light from the camera toward the box, reflect it, and find out where the light is going to be. To solve the light on the left hand side, I used a reflector, rather then a second flash. I balanced a piece of foam core on my wife’s loved dining chair improvised light stand. Foam boards make great reflectors. To make sure I’ll get good light, I pushed the umbrella a bit back so I will have less light fall of and more even lighting on both sides of the power box. Last to worry about was the top. The experiment was the same experiment, but I did not have a way to position a light above the box. To solve this problem, I placed the camera on a tripod and set it to remote trigger activation. This action freed my hand to hold a second foamcore board to above the power box to cover the angles that reflect of the top of it. For back light I use a similar “trick” to the one I did for the gridspot review. Only this time, I threw the light on black muslin. It was set on 1/2 power.